Hundreds of residents near the overflowing Wichita and Brazos rivers remained evacuated from their homes in North Texas on Sunday, uncertain of when they could return. At least 200 people were still displaced from their homes near the Brazos River in Parker County. Some homes sustained minimal damages while up to four feet of water had seeped into others, said Shawn Scott, Parker County emergency management coordinator. Residents with homes on higher ground had been allowed to return home Saturday after evacuating, but hours later authorities encouraged them to seek higher ground as the lake runoff moved downstream, Scott said. Floodwaters weren't expected to go down until later Sunday. But the threat of more rain still loomed in the area, he said. "It's a continuous up and down situation," Scott said. "This could be ongoing for the next few days." Waters rose overnight by 4 feet in one Wichita Falls neighborhood where 175 people left. Meanwhile, the flooding began gradually receding near another neighborhood and kept the water out of those homes, said Barry Levy, a Wichita Falls spokesman. Officials were concerned about contaminants in the water, making them unsure of when they could let residents return after urging them to leave Friday, Levy said. Levels at the Wichita River were slowly dropping after leaving some areas under 6 feet of water, the National Weather Service said. The Red River at Gainesville, just south of the Oklahoma border, also had overflowed by three feet, the National Weather Service said. Flood waters were slowly receding in Central Texas after some areas received the brunt of a deluge last week. But officials were on standby because additional rain could cause more flooding. "Right now it's just sort of wait and see," said Christa Bromley, a spokeswoman for Burnet County Emergency Management. Storms have claimed 11 lives in North and Central Texas in the last few weeks. Authorities were also still searching for two 20-year-old men from Leander whose Jeep Cherokee was found submerged in a creek on Thursday. 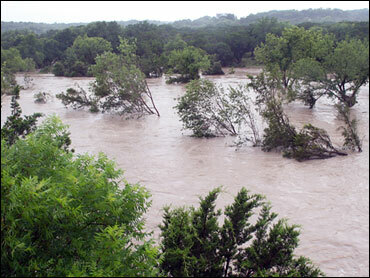 President Bush declared Texas a major disaster area on Friday after storms in the previous week. Bush ordered federal aid for Cooke, Coryell, Denton, Grayson, Lampasas and Tarrant counties. Gov. Rick Perry declared disaster areas in 37 counties across Texas. Residents of those counties will have access to state assistance programs.